Pour out your Holy Spirit on us gathered here. During the summer months we invite you to a single Sunday service at 10:00 am in Rodda Hall. Online giving is an easy way to make your contribution to Chatham UMC without writing checks. Click below to sign up for online donations! You may also download the United Methodist giving app for your phone! We have classes for all ages - Find the class that fits you!! Children - 10:15am Sunday: Pre-K through 2nd grade class meets in Room 1 (lower level); 3rd through 5th grades meet in Room 2 (lower level). Junior High - 10:15am Sunday: Class for grades 6 through 8 meets in Room 4 (lower level). Senior High - 10:15am Sunday: Discussion Group for grades 9 through 12 meets in the Wesley Room (upper level). Adult Discussion Group: Meets between services in Room 6. 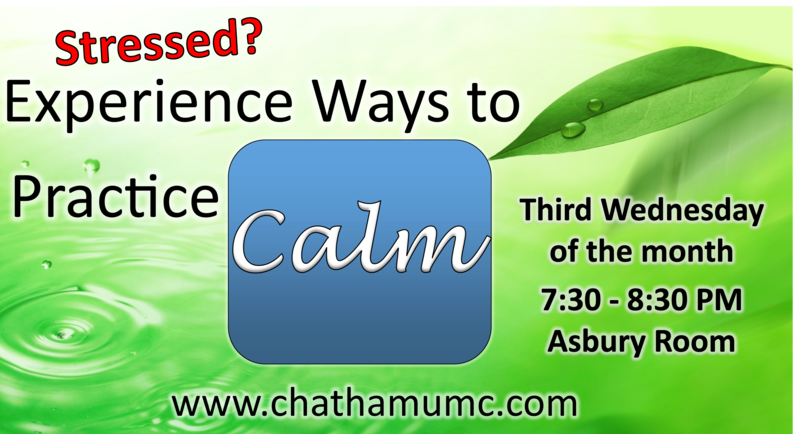 On the 3rd Wednesday of each month, we gather in the Asbury Room from 7:30-8:30pm for some conversation about, and experience of practices that can calm our fears, lower our blood pressure, center ourselves and become more aware. Some call it good mental health practice. Some call it spiritual formation. Either way, it can be very beneficial, healthy, practical and good. All are welcome. No experience necessary. 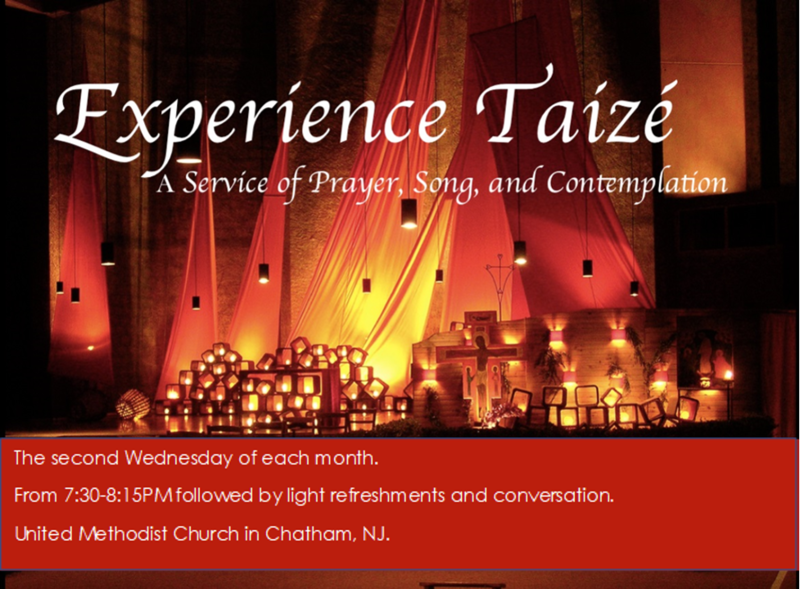 In the midst of the frenetic pace of news, work, life and stress, it is a wonderful opportunity to enjoy the music, beauty, stillness, scriptures, and prayers of a Taizé Prayer Service. For more information, you may call the church office at (973) 635-7740. 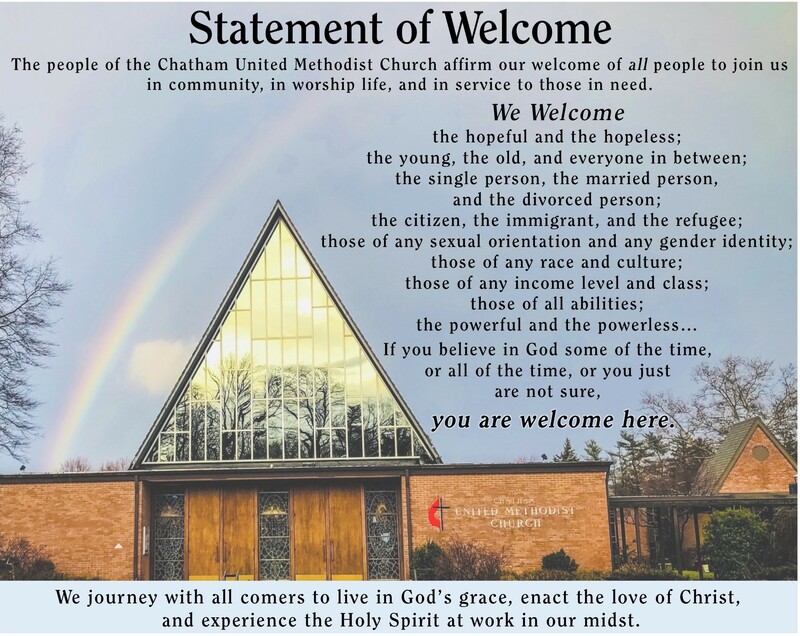 The Chatham UMC Church Council has unanimously adopted a Statement of Welcome. 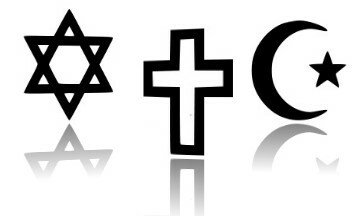 Despite the actions of the General Conference of the United Methodist Church, we continue to believe in the gracious, inclusive, and unquestionable love of God for all people and all of creation. We wholeheartedly support the following Statement of Welcome, as our humble attempt to reflect the best of Methodist spirituality. Volunteering at the MedShare location in Secaucus from 9 - 12. Leaving the church at 8:15 if you would like to car pool. 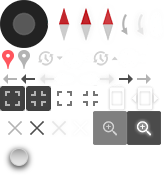 Age requirement (10 years to 13 years with parent or guardian) 14 years or older no restrictions. Returning to the church at approximately 12:30. Please contact Karen Berry or Carolyn Palma with any questions. Sign up sheet is on the bulletin board outside Jeff's office. MedShare Mission: MedShare is a humanitarian aid organization dedicated to improving the quality of life of people, communities and our planet by sourcing and directly delivering surplus medical supplies and equipment to communities in need around the world. MedShare helps increase health system capacity and drives sustainability by providing biomedical equipment training and service to healthcare organizations and medical professionals serving populations in need. 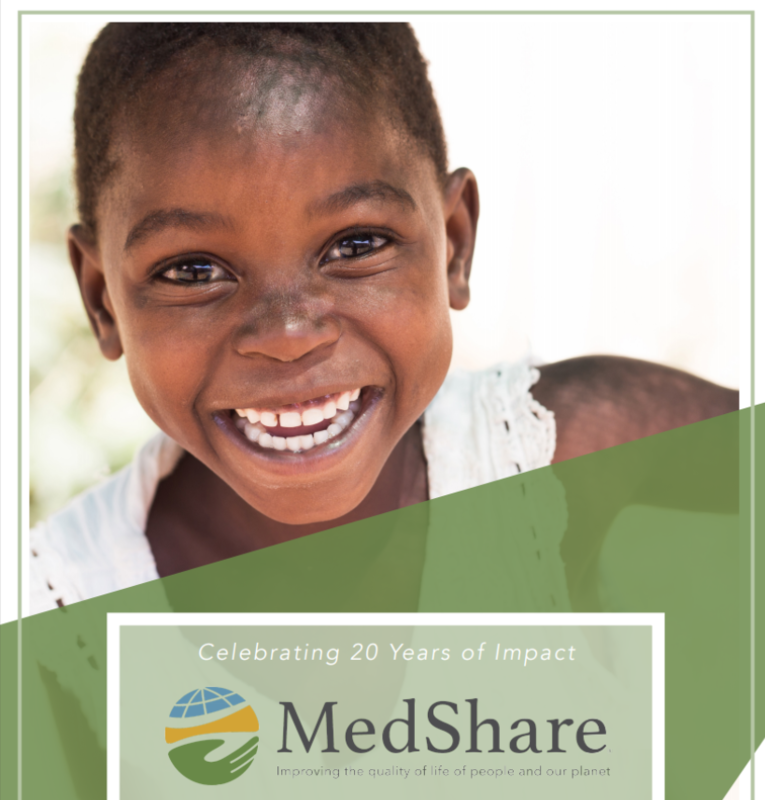 MedShare’s deliveries of vital medical supplies and equipment have decreased our nation’s carbon footprint and brought health, healing and the promise of better lives to 100 countries and countless patients. Located on Main Street next to the Chatham Middle School.